Sand (a sequel to Superfluous) takes place in a distant future where an asteroid has caused a mass extinction and mutations to the global wildlife, with the remainder of humanity attempting to scrape by in the wastelands of Alaska. With the guidance of a mysterious cube you must now explore the land, scavenge what resources you can and build up your own base. As you progress you’ll be able to explore further, farm, trade with towns, recruit AI controlled teammates, go on missions and even drive cars as you delve deeper into the wilderness. You’ll have to be careful though – there are lots of hostile enemies that you can run into that can quickly overwhelm you if you’re not careful. 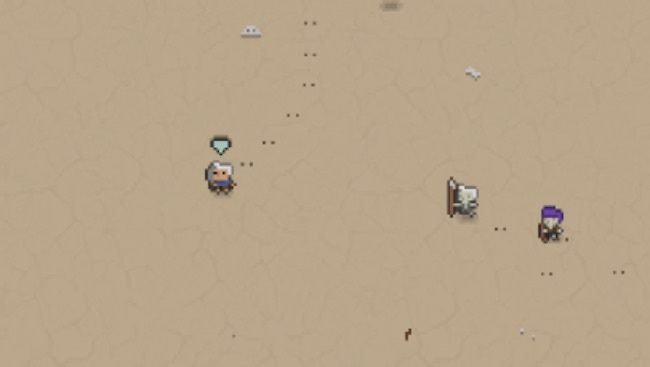 Even in these early stages of development Sand is a very impressive sandbox survival RPG with great pixel art animation, easily accessible gameplay and a large amount of content to play through. There’s lots of land to explore and there’s a huge variety of useful equipment you can craft and pimp your base out with. It may be a hard life in the desert lands of Alaska, but it sure is a lot of fun!